Little Inferno is now available for Mac! You can get it directly from us, on Steam, and on GamersGate. If you previously bought the Windows version from either site, you should now automatically (and freely) have access to the the Mac version as well. Thank you to all our beta testers who helped pull this together! Other updates: Linux version is almost ready for testing, and we’re also working on an iOS update that will work on the older iPhone 4 and iPod Touch 4. Hahaha, awesome. 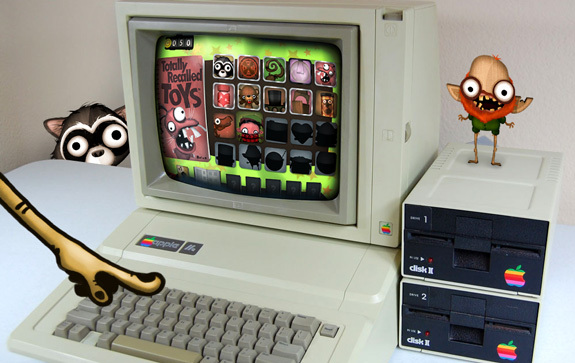 Of course you guys have a pic of it “running” on an Apple II. You never fail to make me laugh. Kudos! ANy news about the Italian translation? And News for the gnu/linux version? Mac version doesn’t support Steam overlay? I read about this on TUAW and came here to read more. Is there a demo? Hey Amiga, no demo at the moment, but there are a ton of videos on youtube that players have created. and downloaded the full verision. just at launch black screen and crash on my macbook. the same happen to me! Where we can find the system requirements? Yes, that is a heart. I'm not in the habit of giving them away, but you guys deserve it. That, and beer. I have a problem. Running an 21,5 inch iMac with 10.8 (latest Update), connected a second screen, I have a lot of Stuttering and Picture-Distortions. And I am really missing a settings panel to turn down the volumne a little bit and to go from fullscreen to window and back. Would be nice if you can add that. Thanks a lot and so far I really enjoy playing. I guess you can toggle fullscreen via “f” and/or Alt + Enter. For the volume there should be a settings.txt in the mac-equivalent folder for %APPDATA%/Little Inferno You can change the volume for sfx e.g. from “1.0” to “0.8” or turn both volumes down. I don’t think there is a volume control during and by the game itself. But as the link is not yet updated for Mac version, let’s wait for someone from Tomorrow Corporation to respond. Ahhh, the linux beta is showing up in Steam (>Properties >Betas). <3 Waiting for the announcement (and password). Thanks for doing a native Linux port! That's one reason why I bought the game. Wow, this is amazing. I’ve waited for so long, and it finally looks like it’s going to happen! We’re looking into Android, but no ETA at the moment. Seriously guys? PC, IOS, Mac and working on a Linus version and no Android version? The game seems really fun and I really want to buy it, but I simply refuse to do so until I can play it on my Asus Transformer. Show us Android fanboys some love, will you? I mean, World of Goo came out and Android, why can’t Little Inferno? I just had a amazing idea for this amazing game you could have a scrapbook type thing so when you do something like get all the combos a second copy of the award is saved there so no matter what you would all ways have it . Hello again. Linux version has been “almost ready for testing” for quite a while now. I would appreciate any news. Also waiting for the Linux version. It would have been a perfect release on http://en.wikipedia.org/wiki/Ice_Saints — well, it wasn’t snowing but pretty cold for May. However it might also be cold days in may. Dear Tomorrow Corporation, we count on you. Because we need a fireplace (high definition entertainment product). I can’t get this to download to ipod touch? Any suggestions? Keeps telling me needs IOS5 update. Just purchased this via the App store for my iMac and the screen ‘Warning Do Not Play With Fire” in full screen and the sound of a gas furnace is all I get for my…. wassup with that???? A little help here please? I’d download from this site but I already spend my $$ at the App store… left a message there also. Hi Betsy, what happens when you click? Do you get an error?